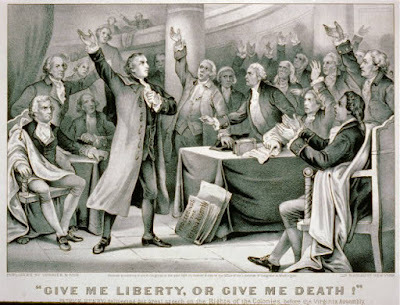 Patrick Henry served in the Virginia House of Burgesses; he was a member of the Virginia committee of Correspondence, a delegate to the Virginia Convention, and a delegate to the Virginia Constitution Ratification Convention. Henry was commissioned as Colonel of the First Virginia regiment on Saturday, August 26, 1775, by the third Virginia Convention. Henry was then in Philadelphia, having been elected by the previous Virginia Convention as a delegate to the Continental Congress. He resigned his position of delegate to return to Virginia to begin organizing his regiment. He played a prominent role in the fifth Virginia convention, which convened on May 6, 1776, and on June 29 was elected the first governor of the Commonwealth under its new constitution, adopted the same day. Patrick Henry served five terms as the first and sixth governor of Virginia. He died in 1799 at his home on Red Hill Plantation in Campbell County. [Source: History.org]. Trust it not, sir; it will prove a snare to your feet. Suffer not yourselves to be betrayed with a kiss. Ask yourselves how this gracious reception of our petition comports with those warlike preparations which cover our waters and darken our land. Are fleets and armies necessary to a work of love and reconciliation? Have we shown ourselves so unwilling to be reconciled that force must be called in to win back our love? Let us not deceive ourselves, sir. These are the implements of war and subjugation; the last arguments to which kings resort. I ask gentlemen, sir, what means this martial array, if its purpose be not to force us to submission? Can gentlemen assign any other possible motive for it? Has Great Britain any enemy, in this quarter of the world, to call for all this accumulation of navies and armies? No, sir, she has none. They are meant for us: they can be meant for no other. They are sent over to bind and rivet upon us those chains which the British ministry have been so long forging. And what have we to oppose to them? Shall we try argument? Sir, we have been trying that for the last ten years. Have we anything new to offer upon the subject? Nothing. We have held the subject up in every light of which it is capable; but it has been all in vain. Shall we resort to entreaty and humble supplication? What terms shall we find which have not been already exhausted? Let us not, I beseech you, sir, deceive ourselves. Sir, we have done everything that could be done to avert the storm which is now coming on. We have petitioned; we have remonstrated; we have supplicated; we have prostrated ourselves before the throne, and have implored its interposition to arrest the tyrannical hands of the ministry and Parliament. Our petitions have been slighted; our remonstrances have produced additional violence and insult; our supplications have been disregarded; and we have been spurned, with contempt, from the foot of the throne! In vain, after these things, may we indulge the fond hope of peace and reconciliation? Listen: Richard Schumann interprets the character of Patrick Henry for The Colonial Williamsburg Foundation. Listen as he re-creates Patrick Henry's powerful words spoken March 23, 1775 at St. John's Henrico Parish Church in Richmond.